Winning Poker Network continues to push the envelope in the US market by being the first to offer a type of Sit n’ Go that has worked out very well for PokerStars over the past couple of months. 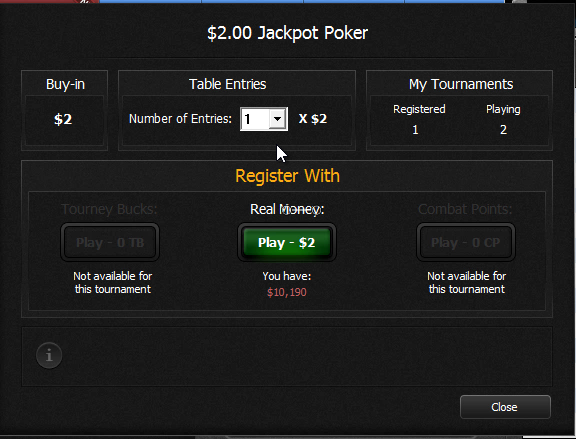 This is another first for Winning Poker Network, in regards to offerings for US-friendly sites! Winning Poker Network Introduces Jackpot Sit n’ Go’s. Winning Poker Network, which is made up of America's Cardroom, Black Chip Poker, PokerHost, True Poker and YaPoker, is always willing to try new things that they think their player base can support. This has allowed them to have one of the best promotions and rewards offerings in the industry for US-friendly sites. Their most recent announcement, adding Jackpot sit n’ go’s, is another step in that direction as it is something that ROW (rest of world) players had been playing in for some time and finally US players will get the chance to starting on April 13th. While the reaction has been a bit mixed across the forums about the move, it’s important to remember that these games appeal most to recreational players and they are unlikely to voice their opinions in the forums. Create an account now at any of the network owned, safe, fast paying, and bitcoin compatible Winning Poker Network skins and recieve a 100% match up to $1,000 USD poker deposit bonus. Jackpot Sit n’ Go’s are meant to be quick and fun and their format embodies that to the largest degree that it could. They are 3-man hyper turbo sit n’ go’s. What makes them so unique is that players don’t know what the prize is until after they enter the sit n’ go, because each one is different. The Winning Poker Network rendition of it allows players to win as much as 2,500 times their buy-in amount. Since Winning Poker Network is going to be introducing these for $2 and $10 at first, that means that players can win up to $25,000 from one sit n’ go. Even if players don’t get to compete for the largest prizes there is still a lot of money up for grabs. At the $2 level players can have a chance to win $4, $8, $12, $16, $40, $200, $400 or $5,000. The chances for each of those payouts varies with the lowest amount happening 70,518 times in every 100,000 opportunities. Also, all prizes $40 and below are winner take all, unless a deal is agreed up, for those prizes above $40 use this default distribution: 1st 75%, 2nd 15% and 3rd 10%. Players will have the opportunity to cut down on variance a bit though by accepting a deal at the beginning of the SNG. Before players are given the chance to see how much the final prize will be they will be prompted with a pop-up asking if they are willing to accept a deal. If all the players accept the deal, and only if, then the prize distribution will be 40%, 30%, 30% among the three players with first getting the 40%. Players will have the ability to have more than one entry without needing to register a bunch of times as the entry screen features a drop down menu for players to use. There are still some question such as: the blind structure, number of sit n’ crush points and other small details that are likely to come out later as we get closer to the April 13th launch date. The initial information though sounds encouraging. Players in the US are going to be getting a little closer to have access to a type of tournament type that seems very interesting and different from anything else that is available right now to them. Also, if the introduction of these tournaments does help bring in recreational players as the Winning Poker Network representative hopes that will then games should get softer, even for those who don’t play this kind of game normally. What do you think of the Jackpot sit n’ go’s? Are you going to play them? Tell us on Twitter or Facebook!